Earlier this summer I took time off work to help out with childcare and to spend some time with my two sons, while their regular child-minder took a much needed and deserved holiday. It turns out that my wife and I had … let’s call them ‘divergent’ … ideas as to what constitutes a ‘fun day out’ for the children. She does things like making aliens out of cardboard boxes and tissues, providing home-made playdough (called ‘squashy’ in our house), and building temporary housing for our garden snails (a snail aquarium, or ‘snailarium’, if you will). I, however, appear to have a different idea of ‘fun’. My tendency is to stick the kids in the car and head out in search of ice-cream, bacon, and archaeological sites … though not necessarily in that order. Results are variable, but we more often than not have a great time looking at interesting sites (and playing hide & seek), arriving home tired, bedraggled, and smelling suspiciously of pork products. This year my plan was to take them west – to beautiful, wonderful, Fermanagh – in search of island experiences. On one of these excursions, we passed through Clogher. Today it seems like a relatively ordinary Tyrone village, but it appears to have been a place of importance, on the intersection of major route ways, from antiquity. Clogher Hillfort probably dates to at least the Late Bronze Age and the complex includes a ring barrow, a possible inauguration mound, along with the banks and ditches of the Hillfort ‘proper’. Excavations by the wonderful Richard Warner in the 1970s, though sadly unpublished, allowed the recovery of numerous high status artefacts including portions of decorative metalwork and exotic pottery. 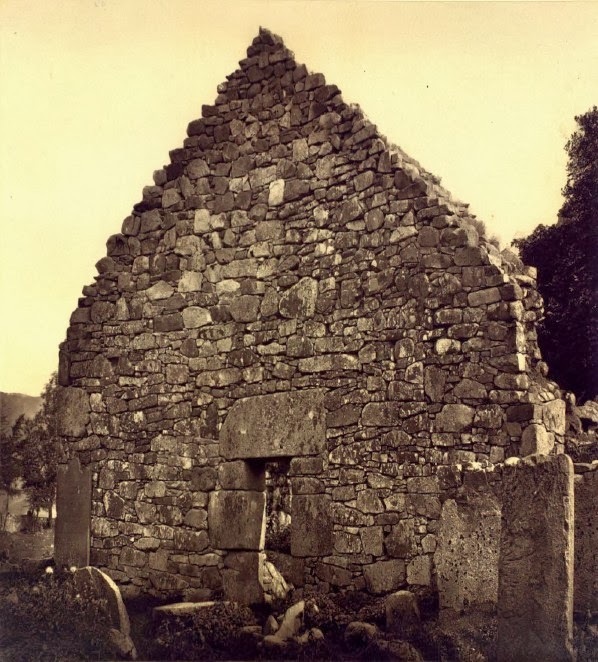 By tradition, the nearby monastic foundation was founded by St. Aedh Mac Cairthinn (c. 430–505 AD), an early disciple of St. Patrick. The site was later recognised as an episcopal see, and it retains its status in the 18th century Cathedral Church of Saint Macartan. In all the years I worked in field archaeology in Northern Ireland, I spent quite a lot of them ‘out west’, in Tyrone, Fermanagh, Derry/Londonderry, and Cavan. I that time I passed through Clogher on more times than I can count – maybe as many as a thousand times … well, going each way every day for months at a go certainly racks up the numbers! In that time, I believe, I only stopped in Clogher once – in the company of the Historic Monuments Council when we stopped to visit Clogher Hillfort. Most of the other times I was rushing to get to work or rushing to come home – never a chance to stop and see the Early Christian High Crosses! This occurred to me on our first summer excursion as I passed through with my boys in the back of the car, moving with all legal velocity towards the delights of Fermanagh. This time, as we passed, I noted that the church appeared to have replaced its gates in the relatively recent past – they’re certainly newer, shinier, and taller than I remembered them. I’ll write about where we went in Fermanagh on some other occasion, but on the way home, I decide to stop the car and see if we could get into see the crosses. I parked, and explained with much enthusiasm to my young sons that (if we could get in) we were going to see a couple of very old crosses. In fairness, they had been tramping about Fermanagh since early morning and their patience was … ‘thin’. It was only when I offered a bribe of (more) ice-cream they reluctantly agreed to follow me. With refreshments purchased, we made our way up to the gates, only to find them locked and barred. Even over the cacophony of the passing traffic, I perceived the sound of knocking. After some blank-faced searching, I spotted an elderly lady in one of the first-floor windows on the far side of the road. Once she was sure she had acquired my attention, she made a series of hand-gestures that I understood to mean ‘go around to the left, there is another entrance there’. I now realise that this was the wrong interpretation of whatever she meant. Instead, we ended up on the grounds of Saint Macartan’s Nursing Home, explaining our situation to a member of the Sisters of Mercy. Unfortunately, there was no entrance on that side and there never had been. The very lovely and kind Sister looked at us three tired and bedraggled travellers, and offered us refreshment. Not wanting to put her to any trouble I, of course, declined. My beautiful sons had, it appears, not read the same manual of etiquette as I, and protested loudly … even more so when they learned that biscuits would also be forthcoming. That was how my sons and I spent a very pleasant late afternoon in Clogher – sipping ice-cold MiWadi orange drink, crunching on biscuits, and passing the time with a delightful nun who made a great fuss over my (suddenly) shy boys. We didn’t get to see the crosses and, if truth be told, I didn’t particularly mind either. We may have missed seeing the crosses, but I’d not forgotten them. A week or two later the whole family was heading west in search of another Fermanagh island experience. As we passed through Clogher, I instinctively glanced to my left at the new gates, giant and impenetrable. Only this time … they were … OPEN!! There was only one thing to do! I dropped anchor and hurriedly pulled the car into the side at the nearest available spot, spraying gravel and divots in my wake. As no one else was interested in accompanying me up the tiny to non-existent pavement, against the prevailing traffic, I grabbed my camera and went for it. As I suddenly faced a very large and fast-moving Scania truck bearing down on me as I rounded the corner, I rather though that I had made a particularly poor decision in attempting to see these crosses and that I was about to meet my end in Clogher. Thankfully, it was not to be and I successfully – just! – negotiated the traffic and got into the churchyard. The crosses are probably of 9th or 10th century date and were found in the grounds of the church and re-erected. Coincidentally, both crosses appear to be missing a portion of their respective shafts and look somewhat squat and inelegant as a result. At 2.75m, the more southerly cross is the taller of the two. Its east face displays a rectangular panel of 18 bosses (set in three columns of six). A similar arrangement probably was repeated further up the shaft, though only eight appear to wholly or partially survive. The centre of the ringed cross head is dominated by a single, large boss with indistinct traces of interlace decoration within it. The two lower ring portions of the cross are decorated with different patterns of interlace and scrollwork. The opposite (west) face is a relatively similar arrangement with a rectangular panel of interlaced circles and knot-work dominating the shaft. Originally an harmonious panel of similar knot-work would have been placed above this, but the effect is spoiled by the missing middle section. Again, the centre of the ringed cross head contains a prominent boss, decorated with interlace, possibly in a triangular or ‘triquerta’ knot pattern. However, owing to the low relief of the surviving carvings, this is difficult to ascertain. All three surviving portions of the outer ring appear to be decorated in an analogous manner to before, though this too was difficult to see in the prevailing light conditions. The north cross is, today, slightly shorter at 2.30m. Its east face of the shaft is dominated by a rough square of four interlaced spirals, and the cross head is decorated with a smaller cross-like arrangement. It is difficult to make out, but it appears to me to be an interlaced cross of sinuous vines, possibly with a four-petalled flower at its centre. The opposite face has a low-relief roundel, or pseudo-boss at the centre of the cross-head, and a diamond of false-relief knot-work in the centre of the shaft. Although, owing to the light conditions, I couldn’t make it out on the day, it appears from other photographs that some decoration exists on the arms of the cross, possibly some low-relief interlace, but it is difficult to be sure. Lying between the two crosses is what appears to be a portion of a shaft of a third cross. At the base of the north cross there is a double bullaun stone. From older photographs (e.g. Richardson & Scarry 1990, Pl. 45) it seems that it once was leant against the base of the south cross, where it was accompanied by the upper stone of a rotary disc quern. I may be wrong, but I did not notice it on my visit, so it may have been moved indoors. Photographs of the site from a 1982 visit by Billy Dunlop (now part of The William Dunlop Archaeological Photographic Archive collection [Facebook | Website]‎) appear to show the same quern stone, if in somewhat more battered condition. Thus, despite the date of the Richardson & Scarry publication, I’m inclined to believe that the photographs used are considerably older. Where I have seen photographs taken inside the cathedral (e.g. here | here), I’ve not noticed it hanging about in the background, so it may not have been placed there for safe keeping. Unless it’s still lurking about around the church or grounds, I’m afraid that it may have been ‘lifted’ and that’s the last we may see of it. While I felt lucky to get into the graveyard, my luck didn’t run so far as to get me past the church door. Inside I would have found an Early Christian sun dial, probably dating to the the period from 700 to 900 AD, and probably the oldest surviving item from the site. Well, maybe it’s all for the best! This way, I still have a reason to keep an eye out for open gates as I go through Clogher. I don’t know what I’ll find – maybe just ice-cream, maybe the sun dial, maybe even the kindness of strangers lavished on weary, parched travellers! Harbison, P. 1992 Guide to the National and Historic Monuments of Ireland. Gill & Macmillan, Dublin. Richardson, H. & Scarry, J. 1990 An Introduction to Irish High Crosses. Mercier Press, Dublin. New Books from Berlin | Curach Bhán is rocking the Iron Age boat! If you hang about this blog for long enough you could easily come away with the impression that I’m engaged in something of a bromance with Wordwell Books. I do seem to review and promote an awful lot of their wares [here | here | here | here | here | here | here | here | here] ... OK that is a lot! The simple reason for this is that they are the major publisher of archaeological books in Ireland. They – or, more accurately, their books – have been constant companions since I first started studying archaeology and encountered the first few issues of Archaeology Ireland magazine in Charlie Byrne’s Bookshop (back when it was still on Dominick Street, Galway). At about the same distant time, I was introduced to Daniel Büchner. He was a visiting student, over in Galway from Berlin. He was amazingly good company – incredibly well read, witty, and hugely generous of his time, knowledge, and friendship. Daniel was instantly recognisable around campus for, firstly, being German (it was the 80s in Galway – we didn’t have too many foreign students in archaeology! ), and secondly, his rather battered top hat, festooned with the maroon-and-white colours of Galway GAA. In his company – and in his little red car – a select group of us got to see quite a number of archaeological sites [including here] … not to mention the insides of an awful lot of pubs. As a result of the latter, I have somewhat hazy recollections of being ‘tired and emotional’ (‘foxed’ if you’re a Georgette Heyer fan) … followed in quick succession by being riotously ‘unwell’ out the window and all down the side of that very same vehicle. As the years have passed we’ve remained good friends and he’s even forgiven me for despoiling his car. For the last number of years, Daniel has been quietly working away as owner and publisher at Curach Bhán Publications [Website | Facebook]. Mostly dedicated to humanities and art, he specialises in Celtic studies, international archaeology, philology, language studies, cultural & social anthropology, art, and literature. 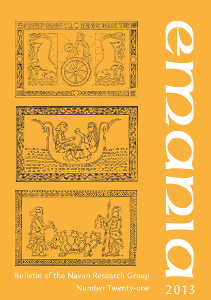 During the summer of 2013, Daniel and Curach Bhán published two new books of particular relevance to Irish archaeology. Unfortunately, my family commitments and generally tumultuous existence (read: sloth) have somewhat stymied my plans to write decent reviews of both these important works. Instead, I have to settle for presenting the contents as a means of wheting your appetite! It’s a delight to see Emania back in circulation and there’s talk of a new volume in the not too distant future. 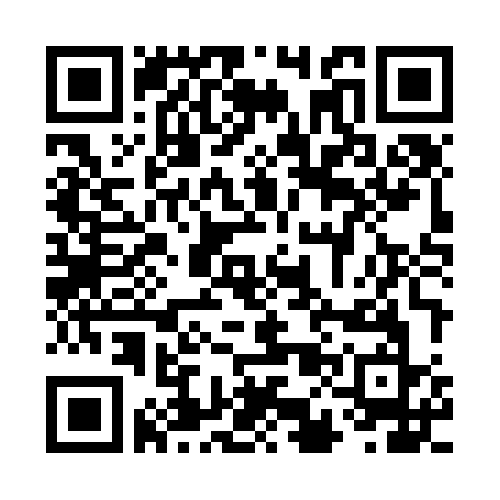 In the meantime, if you are missing any back issues you are sure to find on the Curach Bhán website: here. The contents list of this volume is pretty impressive. Unfortunately, I’ve only had the opportunity to read a few of the papers, and skim through some of the others. However, I can guarantee for the little I’ve seen that this is an excellent read and contains some great papers. No matter how you slice it, there’s plenty of good times to be had here, if the Iron Age and all things Celtic are your reading matter of choice! If you choose to order a book (or several) from Curach Bhán, please tell Daniel that you decided to do it after reading this post. I don’t get paid commission for any sales, but I’m hoping that it will bring a smile on his face and remind him of good nights long gone; of songs, stories, academic debates and far too much imbibing in our misspent youths! In return, you'll get some beautifully produced books at great prices! What's not to like? 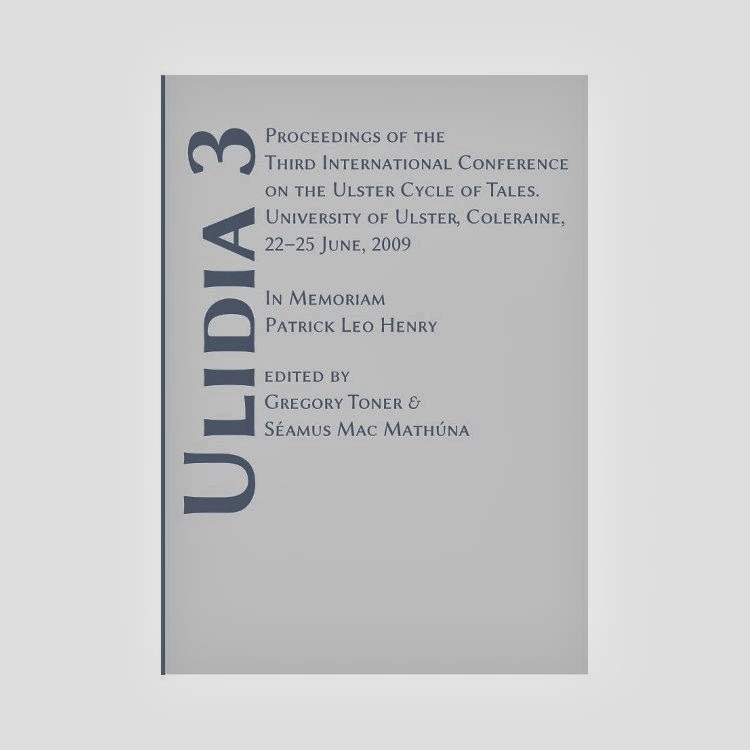 If you’ve known me for any length of time, poked around on the ‘back issues’ of this blog, or even had a browse through my publications on my Academia.edu page, you’ll get a fair inkling that I like gravestones. It’s not too uncommon in an archaeologist – even one such as myself who dedicated most of a career to the prehistoric periods. Like many, my chief interest is in the earlier gravestones from the early to mid 1700s, and into the early 19th century. At a push, I can show curiosity in markers from the mid 19th century onwards, but there is a clear feeling that more recent memorials are less interesting, and less worthy of study. I think I may be alone among archaeologists in having once published a paper (Chapple 2000) that sought to demonstrate that modern memorials – even up to the 1980s – were part of a broad, unbroken continuum, not something separate and apart from the older material. I make this point to indicate that despite my predisposition towards the newer memorials as objects worthy of study, I have still considered them less worthy than the older examples. It’s not that surprising – in every age, the antiquarian or archaeologist have viewed the ubiquitous remains closest to their own time as less worthy of study that older artefacts. Obviously, this is not confined to how students of the past assign worth. Value – either the concept of ‘worthy of study’ or monetary worth – is distinctly tied to scarcity. How else could we rationalise the notion that any given weight of a shiny yellow metal is worth more than an equivalent weight of, say, dark, fertile soil? It is not my intention to debate the rights or wrongs of economics. However, it is this notion that every archaeologist with an interest in the post-Medieval period (1700s and after) has had to face. There has long been a tacit understanding that a hierarchy exists and that while ‘post-Med’ studies are all well and good, they are not truly as important as ‘real’ archaeology – i.e. the Neolithic, the Bronze Age, the Romans, or whatever your own preferred period of study is. Thankfully, this impression is changing within archaeology, even if only slowly. There are now a number of vibrant and thriving organizations dedicated to the archaeology of more recent times. These include The Society for Historical Archaeology in the US, the Society for Post-Medieval Archaeology in the UK, and IPMAG on the island of Ireland. Even still, I have often heard the old adage that post-Medieval excavations keep all the rubbish that other excavations throw away. Even if ‘post-Med’ is starting to find more acceptance and prominence, the sub-discipline of what may be termed ‘modern archaeology’ still has a long way to go. One well-known example is the popular and professional reactions to the famous Transit Van excavation. It has occasionally crossed my mind to ponder on the question: how awful does it have to be before archaeologists refuse to study it? Considering the propensity for archaeologists to literally study piles of old rubbish, from a towering mound of disused amphorae in Rome, to the waste from George Washington’s house, right down to the Tucson Garbage Project, I’ve often presumed that there’s pretty much no limit to what we’ll consider investing our time and cerebral effort in. In events unrelated to these questions, I was recently invited to partake in a discussion on what was described as ‘graveyard tat’ – all the ugly, tasteless, plastic clutter that (in every sense) profanes our graveyards as the places of quiet, contemplation, mourning, and ‘rest eternal’ that they ‘should’ be. I would make it quite clear that I considered this an archaeological question only in so far as it despoiled the beauty of the graveyards – especially our older ones where the recent dead lie shoulder-to-shoulder with their ancestors, often in the shadow of a suitably decaying Medieval ruin. In places like this, I feel, that this form of plastic tat is visually distracting, out of place, and downright ugly – it is repulsive and should, rightly, be condemned. No matter how great the appetite for the archaeology of what one may term ‘more recent times’, I think that only the most ardent would readily embrace this awfulness as an area of study. Well, that’s where I had started in my thinking. However, after having looked at quite a few pictures of this kind of stuff, I find that I have changed my opinion … well, up to a point. I still see this material as horrible tat, but looking on this as archaeologists, we should be aware that – however horrible it is – it is still relatively ephemeral and, in the grand scheme of things, will not last too long on a grave. In a hundred years’ time they will be gone, leaving only the ‘clean’ stone monument. I’m not suggesting for even a second that we should regard them as high art. Nor should we think any better of them as artefacts, no matter how much genuine affection and sorrow they represent by those bereaved. Nonetheless, I do think we should be recording a sample of them – in all their hideous glory – as an archive for future generations of archaeologists, anthropologists, and historians. Once I started thinking about it, I realised that like so many things, this type of material is susceptible to geographic and temporal change. 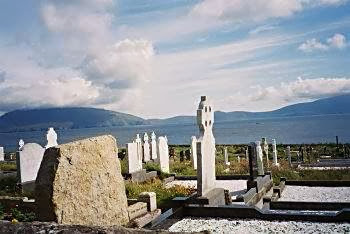 Simply put, what an individual chooses to place on the final resting place of a friend or relative changes over time and locality – what was appropriate (and available) in Ireland or Iceland in 1980 is not likely to be the same in, say, Devon or Dubrovnik in 2010. 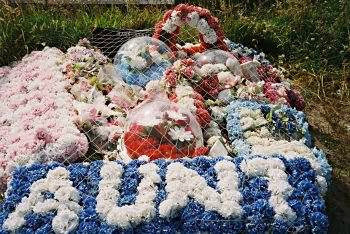 I remember as a child growing up in the west of Ireland attending many funerals where Perspex domes of plastic flowers were placed on the grave. I may be wrong, but I cannot recall having seen any of these for quite some time. During the 1990s, when I spent some time working in the graveyards of Killora and Killogillen, in Craughwell, Co. Galway, I did find some surviving evidence of them – shattered opalescent fragments of the domes, and weathered, decayed, petals still clinging grimly to the rusting wires that once held it all together. Where they survived best was when, past all utility as items of decoration or devotion, they were swept away into quiet corners of the cemetery to lie forgotten in midden piles, or pushed out of sight and out of mind under flat ledgers. One way or another – they’re gone. I honestly doubt that you could find a new one for sale (even if you wanted to) – times have moved on and fashion, along with the ties of manufacture and availability have moved with them. My searching on the internet has been far from exhaustive, but I am unable to find clear images of material like this – certainly not in its pristine state. Going further back, I have dim memories as a child of seeing older versions of this form of item, glass domes over artificial flowers, protected by a wire cage. Again, through the power of the Google image search, I’ve found something similar from a graveyard in Wales. I’m sure that the diligent researcher with ample time to spare could find more examples from closer to their period of manufacture, but I doubt that it could be done with anything approaching ease. 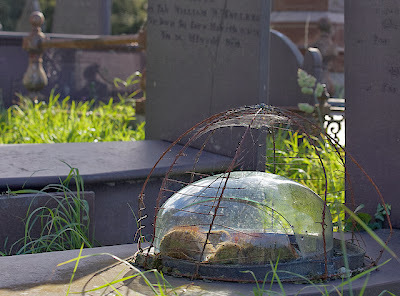 Decaying glass dome protected by rusting wire cage. I think, perhaps, the reasons that we find this detritus so objectionable are manifold. In the first instance, its mass-produced nature seems at odds to the very personal and individual grieving that it represents. Its relative impermanence – certainly in a pristine state – means that for the majority of time that it is publically visible it is either decaying on a relatively new grave, or moldering on a communal cemetery rubbish heap. Tied to this sense of impermanence is the idea that this form of ornament is a relatively modern occurrence. It is pretty easy to fall into this way of thinking – they’re all nasty plastic eyesores, probably with ‘made in China’ or ‘made in Taiwan’ stamped somewhere on them – obviously they’re a modern phenomenon! While this incarnation may be modern, the urge to place symbols of mourning – however impermanent – on the grave of a family member or friend is a strong one and is hardwired into our makeup. I’m sure that there are many examples of older sources out there describing the state of graveyards in times past, but this is my favourite. It is a description of Teampúl Deirbhile, St. Dervila’s Church, near the tip of the Mullet peninsula, Co. Mayo (Dunraven 1875, 107). The graveyard at St. Dervila’s Church, late 20th century. Source. Today, should you choose to visit the site, it is devoid of all this material. However, it – and all of the local cemeteries – abound in its modern equivalent. I am unwilling and unable to bring myself to celebrate the existence of this visual pollutant, nor do I believe that it has even a modicum of redeeming beauty. Nonetheless, I am beginning to appreciate it as having a previously unconsidered archaeological significance. I now intend to go forth into graveyards to photograph these artefacts in all their magnificent awfulness. Truly, they are horrible and possess no redeeming artistic features (to us, in this time) … and I certainly don’t want any of them over me when my time comes … but no more than the fact that I’m fascinated by the description of the graveyard at Teampúl Deirbhile, I’ve started to think that there will be wonder and interest in the tat of today by the archaeologists of the future! Chapple, R. M. 2000 'A Statistical Analysis and Preliminary Classification of Gravestones from Craughwell, Co. Galway' Journal of the Galway Archaeological and Historical Society 52, 155-171. Chapple, R. M. 2011 'Rules, Rubrics and Relations: The conscious and subconscious construction of family structures and public images through gravestone art in Craughwell, Co. Galway, Republic ofIreland' Academia.edu. Chapple, R. M. 2012a 'Workingman’s Dead: Notes on some 17th to 19th century memorials, from the graveyards of Killora and Killogilleen, Craughwell, Co. Galway, Ireland. Part I' Blogspot post. Chapple, R. M. 2012b 'Workingman’s Dead: Notes on some 17th to 19th century memorials, from Killora and Killogilleen,Craughwell, Co. Galway, Ireland. Part II' Blogspot post. 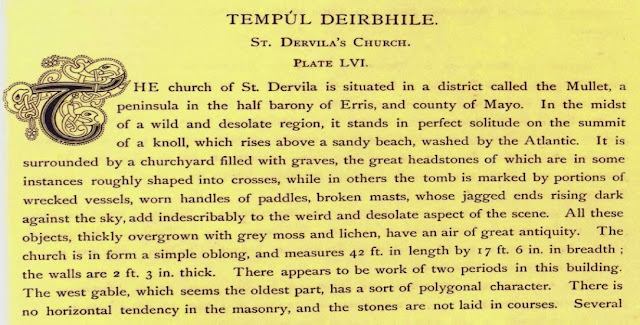 Dunraven, E. 1875 Notes on Irish Architecture. London. Note: It has been brought to my attention that some of my musical references are a tad on the ‘obscure’ side. Obviously, I disagree … but then I would! For any younger readers, or anyone who has not taken early Blues into their hearts the title of this post is taken from Blind Lemon Jefferson’s 1927 recording ‘See That My Grave Is Kept Clean’. You can hear his version of it here; and Bob Dylan’s 1962 recording here. As I reread this piece before publication, it suddenly strikes me that there has got to have been some form of serious study of this type of material. Unfortunately, a few sample Google searches have failed to reveal anything of this nature. If you know of/are the author of such research, please let me know & I will add it to the body of the text.